(Łódź, Poland, July 15, 2016) — MAGIS 2016, a meeting of young adults from all over the world who are involved in Jesuit ministries, will be held in Poland, from July 15 to 25. The event will draw a total of 1600 pilgrims, 400 volunteers and 200 Jesuits hailing from 52 countries. Participants will serve the local community, engage in intercultural dialogue and foster personal and spiritual growth before journeying on to World Youth Day in Kraków. Organized by the Society of Jesus, or the Jesuits, the program is held immediately prior to World Youth Day, a week-long convention of worship and activities culminating with opportunities to see the pope, held every three years. MAGIS 2016 will kick off in Lódz with a special Mass and commissioning. Jesuit Father Adolfo Nicolás, Superior General of the Society of Jesus, recently had a small accident and was told by doctors that he could not attend. Father Tomasz Kot, Jesuit Assistant for Central and Eastern Europe, will be present in Father General’s name and will participate in a question and answer session with participants. Pilgrims will then be sent off on “Ignatian experiments” — activities loosely based on the life experiences of St. Ignatius of Loyola, founder of the Jesuits. A total of 97 different experiments will take place across Poland, the Czech Republic, Slovakia and Lithuania from July 17-23. These will include walking pilgrimages, service projects, artistic expressions, and other activities. Regardless of the type of experiment, each pilgrim’s day will be similarly structured with time for individual prayer, service, Mass, small group sharing, and an Ignatian daily examen, or personal reflection on the events of the day. Each group consists of 25 pilgrims of diverse nationalities, a leader and a Jesuit priest. Following the individual experiments, the participants will close the program by making a pilgrimage to the shrine of the Black Madonna, Our Lady of Czestochowa, in Czestochowa, Poland, to gather and reflect on their experiences on July 23. Finally, they will journey on to World Youth Day in Kraków from July 26-31, meeting up with a larger Catholic international event that could potentially number up to 3 million people — eager to celebrate Mass with Pope Francis, the first Jesuit pope. The word magis, Latin for “more,” references the Ignatian or Jesuit concept of learning more, doing more, choosing more and giving more. The theme of this year’s MAGIS experience, “To give and not count the cost” (a line from St. Ignatius’ prayer for generosity), will ask its participants to do more and “be MAGIS.” The concept of “giving and not counting the cost” at MAGIS was inspired by the WYD theme this year, “Blessed are the merciful, for they will receive mercy,” in light of Pope Francis’ Holy Year of Mercy. “We will help them to grow and to deepen their relationships to God, to others and to themselves, and therefore, be better Christians, people, and basically, to live magis,” says Polish Jesuit Father Waldemar Los, general program coordinator for MAGIS 2016. 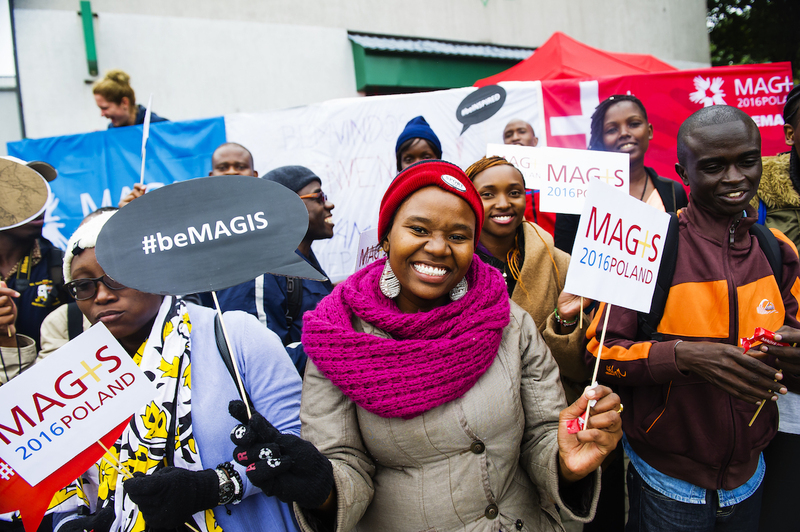 The MAGIS initiative took root at the 1997 World Youth Day in Paris. In 2005, in Cologne, Germany, it was named MAGIS for the first time. The program has since been celebrated in Sydney (2008), Madrid (2011) and Rio de Janeiro (2013). To learn more about MAGIS, visit magis2016.org and follow the MAGIS Poland 2016 pages on Facebook, Twitter, Instagram, Snapchat and Periscope over the course of the event for more updates. Founded in 1540 by Saint Ignatius Loyola, the Society of Jesus (Jesuits) is the largest order of priests and brothers in the Roman Catholic Church. Jesuit priests and brothers are involved in educational, pastoral and spiritual ministries around the world, practicing a faith that promotes justice. The Jesuits came to Poland in 1564. Currently, there are over 500 Jesuits in Poland divided into two provinces. They run two universities, four schools, six retreat houses, a publishing house and 20 parishes. They are also involved in media and serve as chaplains at prisons and hospitals. For more information about the Society of Jesus in Poland, visit jezuici.pl/.